• On the basis of a high-level review of the relevant scientific literature, what impacts is climate change expected to have on the human and natural environment? • What goals would be served by climate change litigation? 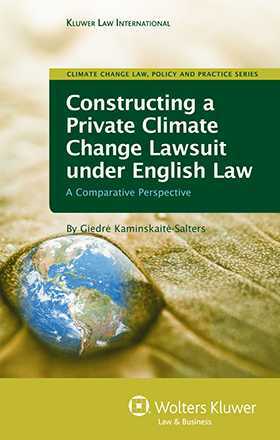 • Under what circumstances would the English Courts accept jurisdiction in relation to a climate change claim? • To what extent can existing tort law precedents – e.g., negligence, product liability, public nuisance – be used in climate change–related claims? • To what extent does the existence of a regulatory framework limit or extinguish the liability of the defendants if they can show full compliance with the provisions of the relevant regulations? • How would the current law of causation need to develop in order to overcome the difficulties inherent in ascribing certain forms of damage to climate change? The analysis considers each available cause of action in turn, setting out the elements that would have to be established, as well as highlighting the obstacles that would need to be overcome if the validity of the claim was to be upheld. The defences that would be available to the defendants are also examined, and their effectiveness at invalidating a claim is tested. In addition, the study assesses the remedies that could be claimed in law and equity for climate change–related damage. The analysis also incorporates examination of case law from tobacco, asbestosis, handguns, and other relevant types of litigation – including climate-based litigation cases in the U.S. – where comparable issues of multiple tortfeasors, proportional liability, materiality thresholds, increase in risk, and other complexities of causation have already been considered at some length. By concentrating on tortious liability, the author clearly shows that litigation can become a significant means of compensating climate change victims, encouraging regulatory change, and facilitating a socioeconomic transition away from the fossil fuel economy. Although the book will be of particular interest to lawyers in multinational corporations and certain non-governmental organizations, the book’s relevance to a much broader spectrum of jurists, academics, and policymakers is undeniable. Introduction.1. Climate Change: The Phenomenon and Its Impacts. 2. Climate Change Litigation in the UK: The Systemic Constraints and Potential Opportunities. 3. Constructing a Climate Change Case: The Building Blocks. 4. Causes of Action: Negligence and Product Liability . 5. Private Nuisance, Public Nuisance and the Rule in Rylands v Fletcher. 6. Causation. Bibliography. Online sources.